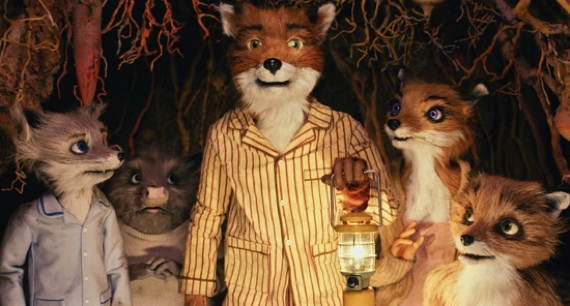 Been meaning to write a post on Fantastic Mr. Fox – Wes Anderson’s marvelous screen version of the classic children’s book of the same name by Roald Dahl. Although it’s been out for about eight months (Nov 2009), we recently saw it and instantly fell in love. Both my children, one eight the other four, were mesmerized by the colors, characters and overall visual approach – and the storyline kept myself and my wife glued to the screen – which is rare when watching a kids’ flick. 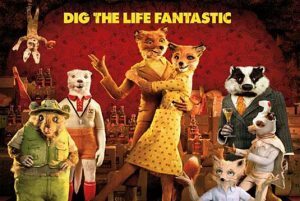 It helps greatly when the voice talent includes George Clooney (as Mr. Fox), Meryl Streep,long-time collaborators Bill Murray, Owen Wilson and Jason Schwartzman. In the age of CGI-based animated spectacles on IMAX screens in mind-blowing 3D – it was a very nice change of pace to see a movie using stop motion to tell the story. It feels so different and precious (in a good way) – considering the amount of effort and painstaking detail necessary to bring the dolls used in the movie to life. And if you’re familiar with Mr. Anderson’s work – Rushmore, The Royal Tenenbaums, The Life Aquatic with Steve Zissou – then you’ll immediately notice the director’s highly recognizable and unique style in this movie. The other remarkable aspect of the picture is the eclectic and surprising soundtrack with songs ranging from The Beach Boys, The Rolling Stones, The Bobby Fuller Four, Burl Ives and magical original music by Alexandre Desplat – the French film composer who has scored over 100 films including The Curious Case of Benjamin Button, Julie and Julia, Syriana, The Golden Compass – to name just a few. We rented it once but then went out and bought it as this movie will be (and has been) watched many times over. If you’ve got kids of any age – I suggest you do the same.